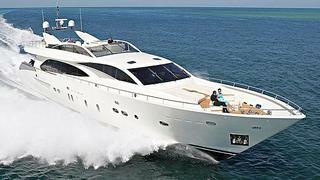 Marcel Borgmann at Sea Independent tells me he's signed the 35m Couach 3300 Fly Sabieha for sale. Built in Kevlar/composite in 2005, she accommodates six guests in three staterooms olus three crew and her twin 2400hp MTU engines give her a cruising speed of 16 knots topping out at 32 Knots. Sabieha is asking €4.95 million.